First of all, I do most of my own work. In my analysis it needs. History.... woman I know owned the car, but couldn't afford repairs, sold it for $1500.. it was running then, no broken windshield. Now the new owner has it and is stuck with it. Her boyfriend bought it to fix up, but he's flown the coup. I looked at the car and told the owner it wasn't worth much more than scrap, I am thinking $400. She is down to $900. It would be a third car for me. Near new tires and A/C works. I'd show up with a truck and trailer and about $600 in folding dollars. I doubt the seller would let you leave without the wagon. LTYLER and Real1shepherd like this. That could be a nice little grocery getter if the interior isn’t too nasty. Well built cars. I have owned 2 300ce's and 3 300e's and currently drive an e320 Cabriolet. Jim's given you the best advice....cash and a trailer talk. The TE's are virtual tanks.....they will go forever once sorted....unless they have rust issues. I have two and one is an original car with almost 300,000 miles. The original car feeds parts into my current TE....like having my own JY....lol. - It is a really nice driving and solid car. The M104 could boogie pretty well when pressing the go pedal. - Yours should not have the eco wiring issue (1992 and up I think). - You have some of the parts and sound like you can DIY. So you can keep the cost down. - Rear window leak by C pillar bottom corner. Might need to R&R the rubber window seal. - Rear SLS suspension might need some work. Usually only need to R&R the Febi accumulators. - Old radio. I ended up with an aftermarket one to add CD playback. its amazing how much stuff you can get into the back of a TE, heh. 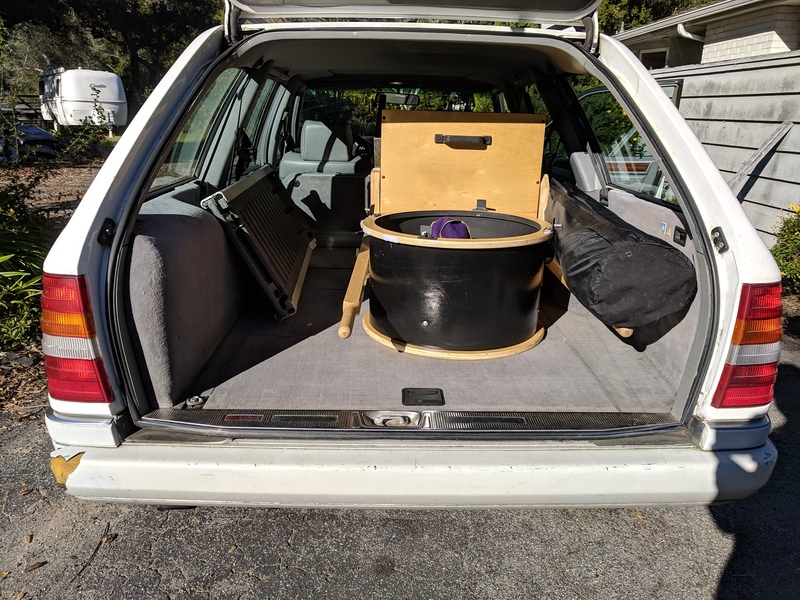 to complete that for a typical astronomy night, I'd add my eyepiece case (a pelican 1500), my bin-o-astro-junk (a plastic carry bin thats maybe 12x18"), a folding chair, and a 6' step ladder on the roof rack (to reach the eyepiece). ecojunk wiring is a 93-98 issue, primarily with the M104 DOHC engines. The ecojunk disease affected ALL MB twin cam engines from the very early 90s through the mid 90s. Didn't matter if you bought a bargain basement C class with a 4 cylinder or a S class with the V12 or anything in between. Eco junk does not discriminate between gas or diesel either. They're all afflicted. Agree with Jayare on the value and purchase strategy. The items on your list are only the ones that you are aware of. Plan for more. One thing about TEs that I love is the huge greenhouse and few if any blind spots when on the road. Hope this one works out for you. I should have qualified that as being specific to US model TE's, where 103 and 104.99x were the only engines offered. but, re DOHC, I thought the CIS 104's (1990-1992? 300CE-24) were immune, that it was the HFM-SFI 104.99x that had the disease.